Radar & Laser Jammer with a built in Detector. 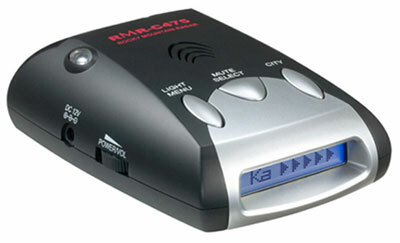 The new RMR-C475 is one of the newest and best VOICE ALERTS radar and laser detector scrambler on the market. It will visually and audibly notify you of police radar and laser guns attempting to read your vehicles speed. The RMR-C475 will also scramble all radar and laser signals from a police radar or laser gun returning a blocked signal, making it virtually impossible for police to read your vehicles speed. The RMR-C475 state-of-the-art radar and laser detector will cover your vehicle a full 360° while the radar and laser jamming portion will cover the front of your vehicle 180° for unbeatable protection. 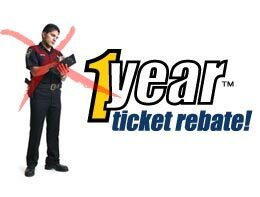 The manufacture is so confident in RMR-C475 effectiveness, they have included free with your purchase, a one year ticket rebate program which will pay any ticket you receive for one full year (some restrictions apply). The scrambler is illegal in CO, UT, CA, NE, OK, MN, IL, TN, VA and SC and Washington, D.C. It's legal in some provinces of Canada and many foreign countries. The C475 can be used in all states except VA, D.C. if scrambler is switched off. RMR-C475 scrambling device blocks police radar and laser, making it virtually impossible to detect your vehicle's speed. The RMR-C475 detects X, K, Ku, Ka and Superwide radar frequencies and works instantly on radar/laser guns and has the ability to scramble any signal it receives. Our jammers do not transmit radio frequencies. The radar portion is a receiver not a transmitter. *This is why our jammers are legal! They have an FM chirp, a mixer, and a waveguide antenna for all radar bands the FCC allows the Police to use ( 7GHz - 38GHz ). The lidar ( laser ) portion transmits a specially modulated field of light from the vehicle with infrared diodes that cover all three laser guns in use today. The radar and lidar portions of our jammers confuse the radar and laser guns which prevent a hard reading of your speed. This makes your vehicle electronically invisible to police radar and laser guns. The radar jamming circuit mixes a doppler FM chirp with the incoming police radar signal and reflects it back to the radar gun. The computer in the radar gun must receive eight identical, consecutive readings before it will display your speed. All the different speeds contained in the FM chirp confuse the computer in the radar gun so it does not display any speed. This effect duplicates the normal operation that the officer usually sees. Since it is normal to occasionally lose the target speed, the officer is not suspicious. Reasonable care should be used as flagrant violators could still be caught visually with an estimated speed.